CRACK THE CODE AND YOU’LL SAVE LIVES…BUT KNOWING IT EXISTS COULD GET YOU KILLED. I am not a fan of spy novels but this was great! It was so thrilling and exciting, that even I couldn't help but like it. I loved Parris! She was a badass and wasn't afraid to get dirty when she needed to. Not to mention how incredibly smart she was. She could hold her own in a fight or a political/scientific conversation. That is something I can't do, fight or hold my won in a conversation. That fight scene in chapter one made me glued to the book until the very end. The fights were so detailed that I felt like I was there throwing punches too. It had my heart racing at scenes, it was so good. I am one girl that loves a good fight scene, especially when it's a girl that is very clearly winning. It was awesome how good at her job she was, like when she knew the maid was not really a maid. I'm not usually one to enjoy a book that has so much politics in it, politics bore me. But there were so many fight scenes and not to mention the bedroom scenes that it made it okay. I didn't find myself bored, even in the more political parts. I think a great deal of that is due to the fact that the characters were so great! They were all interesting and worked well together. They played on each others strong suits and it just felt like they fit together. Ridley Fox, dreamy is all that comes to my mind. He was a truly awesome character. 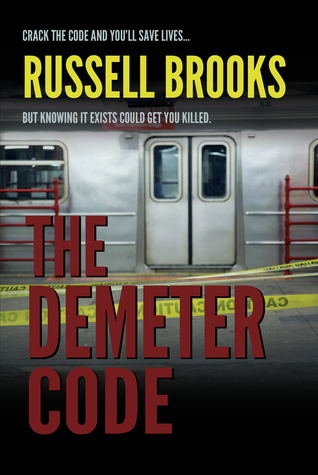 The Demeter Code was very well written, hats off to Russell Brooks for doing such an amazing job. He turned someone who doesn't care for spy thrillers into a fan and that is an accomplishment not to be take lightly. I'm usually one to say if I didn't like something but I can't say that here. The plot wasn't too predictable which I imagine can kill a spy thriller. The plot and storyline were both unique and exciting. This was seriously a great book.